New York - Amazon is clearly entering its Prime. Meaning, of course, its $100 annual membership program, now a decade old, which has accomplished the remarkable feat of convincing millions of people to pay an annual fee for the privilege of, well, shopping. 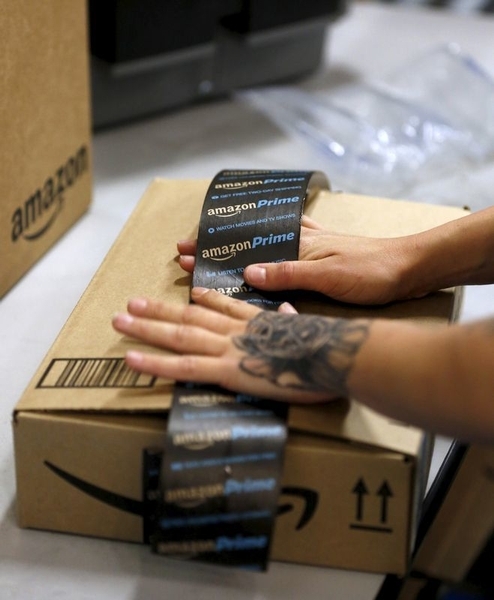 Prime is now central to Amazon’s strategy of dominating the world of commerce. What started as a yearly fee for free two-day shipping now offers a sometimes bewildering array of perks, including household product subscriptions, one and two hour Prime Now delivery, streaming music and video, e-books, groceries (for an additional $200 a year), photo storage and more. “Prime has become an all-you-can-eat, physical-digital hybrid,” Amazon founder and CEO Jeff Bezos wrote in his annual shareholder letter in April. He wants the service to be such a good deal that you’d be “irresponsible” not to sign up, he wrote. Prime shoppers helped drive Amazon’s surprise profit surge in the first quarter. Shares of the e-commerce giant jumped in after-hours trading Thursday after it reported a 28 percent jump in revenue, to $29.13 billion. Net income was $513 million, compared to a loss in the year-earlier quarter. Amazon doesn’t release detailed numbers on Prime, although Bezos wrote that Prime has “tens of millions” of subscribers. Wedbush Securities analyst Michael Pachter estimates there are about 50 million Prime members. Even a 25 percent price increase in 2014, the only one for Prime in 10 years, hasn’t appreciably dampened enthusiasm for the program. Membership grew 51 percent last year, including 47 percent growth in the U.S., according to Bezos. Pachter estimates that Prime members spend about four times what others do, and account for about a third of all Amazon purchases. “That’s why Prime matters,” he said. Of course, Amazon Prime isn’t for everyone. Those that shop infrequently online won’t find the $100-a-year fee worth it. With an estimated 244 million registered Amazon accounts, a large majority of Amazon shoppers — roughly 80 percent, in fact — haven’t signed up yet. Investors have long griped about Amazon’s strategy of investing the revenue it makes into new offerings, leading to little or no earnings growth. But the first quarter results were the fourth in a row in which Amazon reported a profit, which some analysts interpret as a willingness to rein in costs when needed. Chief financial officer Brian Olavsky, however, told reporters on a conference call that the company’s profits stem mostly from strong growth in sales. The company isn’t slowing its investments, he said, citing recent spending on logistics and original programming for its streaming video service. my son uses prime; he says he gets delivery very quickly. He works long hours and does not have time to shop leisurely and if he does not like what he bought so he returns it to Amazon with no return charge. can you tell me how amazon is a rip off ? I sincerely want to know. Do you find Target and E-bay to be cheaper? please tell me how. One amazing perk not mentioned here is no minimum order for free shipping. Need a pair of nail clippers? Click, click, click, in two days they are in your mail box. For pesach, I needed a new peeler. Same deal. I split the cost of prime with my mom, because you can have two adult household members, even in different states. I love prime! After 1 year on Prime I haven't returned, it's not worth the price unless you order at least monthly if not bi-monthly. And they don't offer cheap prices anymore. Most basic household items are much cheaper in Walmart and delivery comes within 2-3 days without the heavy markup. Amazon is definitely not what it used to be. I love amazon and I made close to 150 orders last year. The only thing I don't buy on Amazon is food products because they are more pricey. Otherwise I buy everything on Amazon. Shoes, electronics, household items, picture frames, diapers etc. Compare Prices and you will see that generally Amaozn is more expensive. Its not across all items but if you price it right you will see that others are cheaper and don't charge $100 for free shipping. Just one of many examples, price Pampers diapers. With a target card (free of charge) its five percent off + free shipping + target has a program were if you spend a certain amount on pampers items (like $75) you get $10 off next purchase. A similar program exists with baby formula. At target I spend around $137 + free shipping for 6 23.2 oz of simailac. Show me someone who beats that. The Amazon thing is a myth. It is more convenient and fast delivery. So if that's your thing like one commentor posted then use Amazon. But if you are looking for cheaper prices shop around. Very well said. People also don't realize that Target and walmart have to charge the same price both on-line and in store. That leaves them very little wiggle room to mark up the price because of the shipping. Amazon on the other hand just bakes the free shipping into the price either via prime or just jacking up the price. “ One amazing perk not mentioned here is no minimum order for free shipping. Yes its very convenient but not the most cost effective.